In late 2002, the Rockefeller Brothers Fund established the Democratic Practice program, a new formulation and a new area of focus. The framework for the program, as approved by the trustees in October 2002, declared: "The RBF's program on Democratic Practice will support efforts to strengthen democracy in the United States, in other nation states, and in transnational decision making." The framework for the U.S. program emphasized fostering civic engagement and working for responsive and effective governance. When the program was launched in January 2003, staff explored the wide range of opportunities presented by these broad goals, identifying and supporting promising leaders and organizations and building on the track records of these grantees to develop the specifics of the program through practice. (The U.S. program guidelines were later refined and amended in 2010 and 2013.) Early on, staff identified money in politics as an important topic, and found public funding of political campaigns to be a promising solution. In June 2004, initial grants to two organizations active in promoting public financing -- the Piper Fund of the Proteus Fund, and Public Campaign -- were approved by the trustees. During the 10 years since, money in politics has continued to be one of the central themes of the Democratic Practice program portfolio focused on the United States, constituting 22 percent of its grantmaking during this period. The Democratic Practice program also has a portfolio devoted to global governance that is beyond the scope of this assessment. 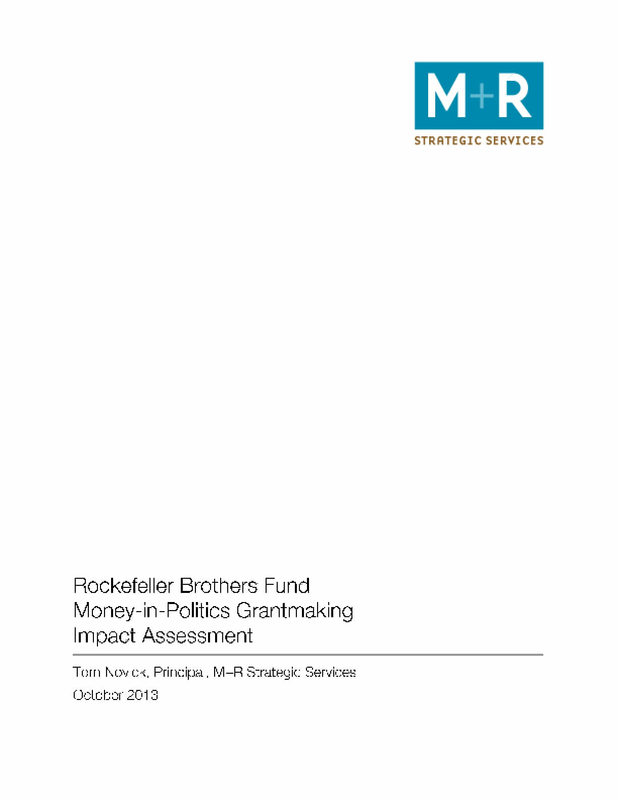 In June 2013, the RBF contracted with M+R Strategic Services (M+R) to conduct an impact assessment of its money-in-politics grantmaking. The purpose of the impact assessment was to step back after 10 years of grantmaking and, in light of impending staff changes, review the money-in-politics portfolio, including related transparency grants. The goal was to provide an assessment of the RBF's role in the field, the evolution of the program over the past decade, the strengths and weaknesses of its strategies and grantmaking, and the contribution of RBF grantees (and the RBF) to progress in the field, as well as to suggest possible approaches going forward. Copyright 2013 by M+R Strategic Services. All rights reserved.